Space Shuttle Discovery arrived at her new home today - the National Air and Space Museum at the Udvar-Hazy Center, adjacent to Dulles International Airport outside of Washington, DC. While the news of her arrival had been circulated here in Washington for some time, it would seem that many people made their decision to see her arrive at the last minute. My original plan had been to cover the landing out at Dulles, but the Smithsonian's press office told me there was only one location for that and that they wanted to limit it to still photographers and videographers if at all possible - so I yielded a slot to the pros. I found out this morning that they were letting all media in to that location. Oh well. I also turned down several TV studio offers. I did not want to be inside a studio when Discovery flew over. As I sat in my home office in Reston, a few miles from Dulles, and watched the flyover on TV, it became clear that people were dropping what they were doing to go outside to catch a glimpse. Discovery arrived early in DC airspace so it just kept circling around and around, thus increasing the viral buzz online and on TV. 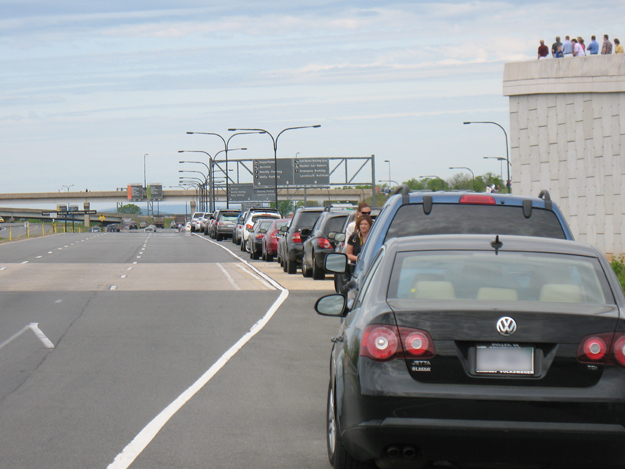 Soon, I heard reports of hundreds of cars pulled over on local freeways and people standing on car roofs. So, I hopped into my car and drove toward Dulles airport. Within minutes I started to see cars pulled over for no reason. As soon as I got onto the airport itself the roads were lined thick on either side with cars - and more were parking every second. People had walked up onto bridges where you never see pedestrians. 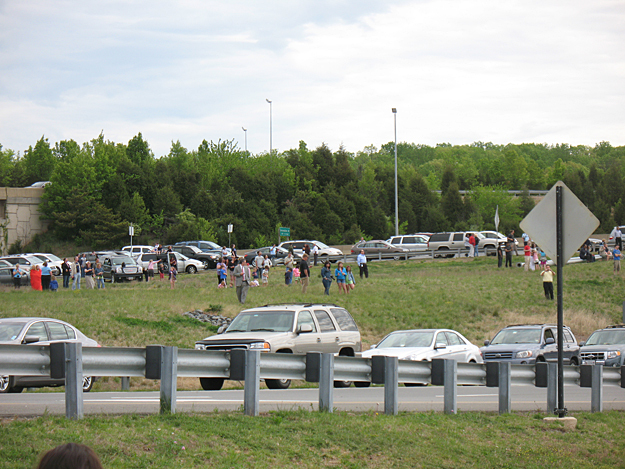 Others congregated in the grassy regions inside of entrance and exit ramps. Again, these are places you simply never see people - much less crowds. This was an immense flash mob that appeared so fast that the police did not have time to respond. No one was directing traffic yet everyone seemed to be cool about being considerate and safe. After 10 minutes or so, people were starting to scan the skies. The shuttle was supposed to be on its way, the radio said. Rooftops of nearby hotels and office buildings now had lines of people across their skylines. The air was crackling with anticipation. And just as I thought that we might miss it, I heard children start to scream. Suddenly, out of the south there was a rumble and then Discovery atop her 747 carrier and T-38 chase plane literally blasted into the sky mere hundreds of feet over our heads. The crowd literally went wild. 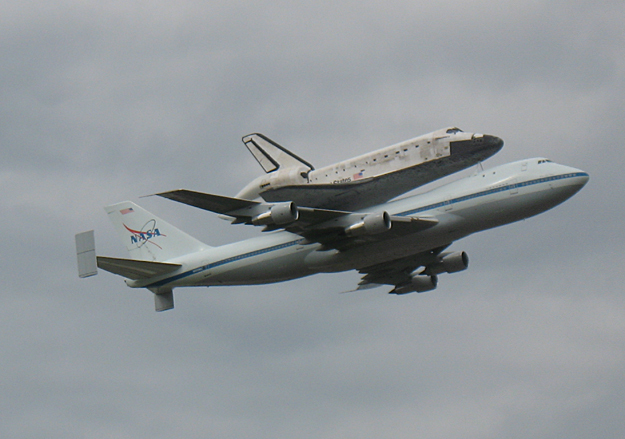 Within moments Discovery had arched to the northwest, heading for a closer swing around Dulles. If you want an idea what the flyby was like - go to this video and advance to 2:40. Yea, just like that. From what I could gather from people around me, some parents had told their kids not to go to school today. A retired couple said they decided to watch some history. And the two women in the car in front of me couldn't have been more excited. It ends up that one of them used to work at NASA Goddard. They had run out of their house on the spur of the moment and one of them had forgotten to put on shoes. Like thousands of people I grew up with the Space Shuttle. It was designed in the 70s when I was in high school. While retirement is a few years away for me, the shuttle is now being retired. I stood inside of Discovery as she was being assembled when I worked at Rockwell International in Downey in the early 1980s. I never grew tired of the sight of walking by her crew compartment, forward fuselage, and aft fuselage every day as they were slowly outfitted on the factory floor. I even held pieces of her in my hands. I was so jazzed about working there that I often referred to the place as "The Rocket Factory", my friends have flown aboard her, and things I helped designed were carried aloft inside of her. Now Discovery will take the place of her sister ship Enterprise a short drive from my home. If I really wanted to, I could walk by her again every day - just like I did when she and I were young.